2. Shah Al-i-Rasul (d. 1297/1879). 3. Shaykh and ‘Abd al-Rahman Makki (d. 1301/1883). 4. Shaykh Husayn bin Saleh. (d. 1302/1884). On 14th Sha‘ban 1286/1869 he started issuing Fatawa and gave verdicts on Muslim jurisprodence.11. At that time he was only a boy of less than 14 years old.12. Afterwards he attained such eminence in this field that the scholars of the Indo-Pak subcontinent and also of the Islamic World acknowledged him as a great jurist.13. He had full command over Muslim Jurisprudence so much so that he differed in certain verdicts with the great Islamic savants like Allama Shami, Allama Tahtawi and Shah Wali Allah etc.14. He had great insight in Fiqh. The following Savants, Scholars, Philosophers and Journalists highly praised his scholarship and command over Muslim Jurisprudence. �Mawlana Ahmad Rida Khan is the founder of Bareilvi school of thought and one of the most important scholars of this era. (Quoted in �Tarjuman-i-Ahl-i-Sunnat�, Karachi, December, 1975 : p. 27). Lean and thin yet he possessed a gigantic personality. He left a profound issuance over his epoch. None among his contemporaries was as powerful as to influence the majority of Muslim population of Indo-Pak Sub-continent all alone from East to West and from North to South. The religious turn of mind of Ahmad Rida Khan was in creed and law unalterably determined by the old traditional views. ii. To uproot the innovations prevalent in Muslim society. He hit the targets in these fields with unshakable confidence and accuracy that none among his contemporary scholars could claim to be his equal. This is not an exaggeration. His voluminous works, a hidden treasure to be explored by the orientalists of the world, will bear the testimony to this fact. He reviewed and revolutionized the Muslim Society, especially the Muslims of Indo-Pak Sub-continent, that is why the Arab scholars like Shaykh Ismail bin Khalil and Shaykh Musa Ali Shami commended him as the Revivalist of the 14th Century A.H. 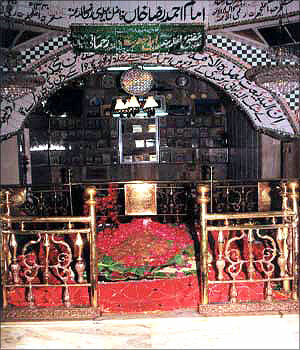 In 1322/1904 he founded Dar-al-Ulum Manzar-i-lslam at Bareilly (U.P. India), which played an important role, but the fame and prestige of Ahmad Rida Khan was not indebted to this Dar al-Ulum like others. Scores of Dar-al-Ulum in India and especially in Pakistan are under his influence. Being the grandson of such a warrior he could not remain aloof from Freedom Movement. Although he did not take any active part yet he paved the way for freedom with his brilliant philosophy based on the Holy Quran and Hadith. It is his love of freedom that the personalities like Mawlana Fadl-I-Haq (d. 1278/1861) 32 and the Martyr peot Mawlana Kifayat Ali Kafi (d.1275/1858) 33 had been his favourite models. He was against Hindu-Muslim Unity. This was the basic idea which can rightly be called the foundation of Pakistan. In 1946/1366 an ideal conference was held at Benares (India) Hundreds and thousands Ulamas (followers of Ahmad Rida Khan) from all over Indo-Pak Sub-continent attended this conference. A resolution was unanimously passed in favour of Pakistan and thenceforward his caliphs and desciple and followers expanded and enhanced their political activities all over Indo-Pak Sub-continent. 36 Among them the following were prominent: -1. Mawlana Sayyid Muhammad Muhaddith (d. 1383/1963). 3. Mawlana Sayyid Muhammad Ahmad (d. 1380/1961). 4. Mufti Muhammad Umar (d. 1385/1966). 6. Mawlana Muhammad Sharif (d. 1371/1951). The love of Holy Prophet (S.A.W.) is the summum bonum of Islamic politics and has played important role in the history of Muslim World. Ahmad Rida Khan was the Torch Bearer of this love in the Indo-Pak Sub-continent. The only Motto of his life was the � love of the Holy Prophet � (S.A.W.) and he could leave no stone unturned in defending this love. Throughout his life and in all his works he maintained this Motto and in this respect he could not compromise with any.His poetry totally depended on this love. Hence it has great religio-political importance. He awakened the Muslim Nation from a sound sleep, purified their hearts and kindled the fire of love in an atmosphere where the people tried their best to extinguish it. Ahmad Rida Khan had two sons and five daughters. His son�s Mawlana Hamid Rida Khan (d. 1362/1934) and Mawlana Mustafa Raza Khan (b. 1310/1892) are celebrated savants of Islam. They rendered great services to Islam and the Muslim Nation In India. � Shaykh Multammad Abd al-Hayy. � Shaykh Muhammad Bin Abi Bakr. � Shaykh Muhammad Sa�id, etc. etc. � Mawlana Hamid Rida Khan (d. 1362/1943). � Mawlana Muhammad Zafar al-Din (d. 1382/1962). � Mawlana Didar Ali (d. 1354/1935). � Mawlana Amdjad Ali 54 (d. 1367/1948). � Mawlana Muhammad Na�im al-Din 55 (d. 1367/1948). � Mawlana Shah Sulayman Ashraf (d. 1352/1933). � Mawlana Sayyid Ahmad Ashraf (d. 1344/1925). I. Mawlana Mustafa Rida Khan (Bareilly, lndia). II. Mufti Diya al-Din (Madina, Saudi Arabia). III. 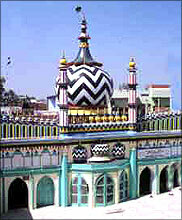 Mawlana Burhan al-Haq (Jabalpur, India). IV. Mawlana Sayyid Ahmad (Lahore, Pakistan). V. Abu al-Barakat.WorksAhmad Rida Khan was a genius writer. He started writing from his early age. His first book was the Arabic commentary of Hidaya al-Nahv which he wrote at the age of ten years. The second book was Dau al-Nihaya in Arabic, which he wrote in 1285/1868 at the age of thirteen. He wrote numerous books and treatises in Arabic, Persian, and Urdu on diversified topics. These are estimated more than 1000 on more than 50 branches of knowledge 57 In 1305/1887 at the age of 30 years he had completed 75 books and treatises. 58 In 1327/1909 this number increased up to 500. 59 Apart from these contributions he had written annotation 60 and Commentator on more than 150 books pertaining to various branches of learning. 61. But it is deplorable that even scholar like Dr. S. M. Ikram was unaware of the correct number of Ahmad Raza Khan writings, and their real value that is why he writes: -Mawlana Ahmad Raza Khan wrote some fifty pamphlets on controversial subject. 62 But in this special branch the correct number is more than 500. I have gone throught some pamphlets and I can dare to say that each pamphlet is a research paper of high degree whose bibliography consists of books innumerable. His books and treatises are lying un published at Bareilly., Murad Abad, Lahore, Karachi, etc., so far. The most voluminous work is the collection of Verdicts i.e. Fatawa-i-Ridawiyya. In 1324/1904, he had completed its 7 volumes, which afterwards increased upto 12 volumes of 26� x 20� / 8� size each volume containing more than 1000 pages. When Shaykh Ismail Khalil, the Curator of Library at Mecca read the specimen of these Fatawa (Verdicts) he was puffed up with joy and wrote to Ahmad Rida Khan:By God if Abu Hanifa Nu�man would have gone through these Fatawa undoubtedly it could have been his heart's delight and granted its writer among his pupils. 64 A prominent figure from the opposition camp and a famous writer Hakim Abd al-Hayy of Lucknow (d. 1341/1923) admits: -During his stay at Mecca and Madina (1324/1906) he wrote several treatises and gave verdicts to some questions received from the scholars. They were dumb strikes to see his vast informations on the text of books on Muslim Jurisprudence and disputed dogmas; his rapid writing and intelligences. 65A renowned theologian and a great saint of Delhi, Hadrat Mawlana Zayd Abu l-Hassan Faruqi (who completed his education at Al-Azhar, Cairo) acknowledged the unrivalled mastery of Mawlana Ahmad Raza Khan over jurisprudence and other branches of learning in the following words: -� None can deny the erudition of Mawlana Ahmad Raza Khan in the field of Fiqh. He was, no doubt the greatest Faqih (Jurist) of his time.�He added: -Kifayat al-Mufti of Mawlana Kifayat Allah (compiled and published by Mawalana Hafiz al-Rahman Wasif at Delhi) is simply of little value to me, as it provides no reference or citation. Hence its validity is questionable. On the contrary the Fatawa of Ahmad Raza are not only argumentatively convincing and rational but are supported by authentic references. They are unique in depth and magnitude and broaden ones horizons of vision. They are an assest to know and remember scores of references. One should not, however, look to that image of Ahmad Raza which the pseudo-scholars have envisaged. There was no equal to him in scholarship and the profound knowledge of jurisprudence among his contemporaries. (Quoted from a despatch of Mawlana Muhammad Mukkarrum, Fathpuri Mosque Delhi, dated December 18, 1975).Even the antagonists of Ahmad Raza Khan referred to these Fatawa. For instance, the great Mufti of his opposite camp Mawlana Kifayat Allah (d. 1372/1952), consulted and ratiocinated these Fatawa and admitted that Mawlana Ahmad Raza Khan had full command over the subtleties of Muslim Jurisprudence as stated by Allama Mufti Muhammad Mahmud of Alwar (Hyderabad--- Pakistan). The second important work which Ahmad Raza Khan contributed towards religious knowledge is the translation of the Holy Quran in Urdu language. It has its own characteristics. This translation was published under the title of Kanz al-Iman with marginal notes by his Caliph Mawlana Muhammad Na�im al-Din under the title Khaza�n al-Irfan in 1330/1911. There are many complete and incomplete translations of the Holy Quran in Urdu language. More than 25 translations had been compiled before Kanz al-Iman while more than 50 have been compiled after its publication. But in all these translations, Kanz-al-Iman seems to stand first. The translator passed smoothly from such delicate places where it was impossible. Copyright © 2006 - 2019 Idara-i-Mas‘udia All rights reserved.